Enjoy the warm and friendly hospitality of America's Christmas Hometown...Santa Claus, Indiana. Santa's Tourism Activities will include visits to many of the community's famous attractions and landmarks. Be sure to register for the tour at the Meet and Greet or pick up the information packet and take a self guided tour. Santa Claus Christmas Store-Enjoy shopping at the gigantic Santa Claus Christmas Store, featuring Christmas gifts, decorations, collectibles, fudge and other sweet treats, and so much more. Visit with Santa during the summer and Christmas season. This family-owned and operated business fills 7,500 square feet with a huge selection of indoor and outdoor lights, wreaths, tree trimmings, nativities, and Christmas yard art. Santa Claus Post Office-The Santa Claus Post Office is the only post office in the world with the Santa Claus name! Stop by to receive the famous Santa Claus postmark during the Christmas season and see where thousands of letters are mailed to Santa each year. Santa Claus City Hall-The municipal building that is the center of government of Santa Claus, Indiana. A replica of the famous Santa Claus Statue stands in the front court yard of the building. Christmas Lake Village- The mission of Christmas Lake Village is to grow a unique, gated living experience, highlighting the beautiful natural surroundings in a friendly atmosphere. Within Christmas Lake Village there are 26 miles of private roads, 3 lakes, a beach, recreation center, fishing, boating, 2,100 lots, 850 homes, and a park. Christmas Lake Golf Course-Christmas Lake Golf Course has earned an excellent reputation among golfers all over the world. Known for its rolling hills, valleys, and sparkling lakes, this well-manicured course is peaceful as well as beautiful. This full-service, par 72, championship golf course is open to the public and includes a practice putting green, full driving range, the Golf Shop, and the 19th Hole Clubhouse for all your food and beverage needs. 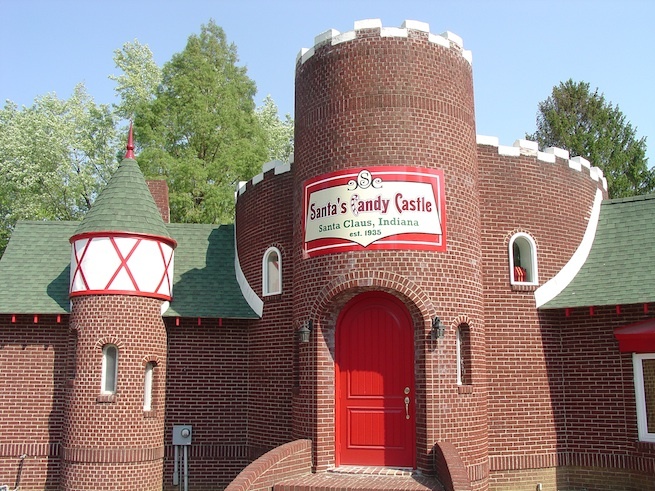 Santa's Candy Castle-The historic Santa's Candy Castle offers a festive experience blending the old-world charm with a modern-day spin and provides a magical experience for believers of all ages. See the Santa Claus Hall of Fame and the Santa Claus Oath exhibits. Visitors can log onto the exclusive "North Pole Network" where they will be directly connected to the North Pole and can chat with one of Santa's very own elves! Don't forget to indulge yourself with a wonderful selection of gourmet confections including peanut butter fudge, turtles, toffee, caramels, salt water taffy, frozen hot chocolate, and more! Santa Claus Statue-The Santa Claus Statue, dedicated to the children of the world, was erected in 1935. Twenty-two feet high and made of concrete, this cherished landmark has a base in the shape of the Star of Bethlehem, with its principal point showing the way east to the land of the Christmas story. Lincoln Boyhood National Memorial -Visit the site where Abraham Lincoln spent his childhood and learn about the lives of the Lincoln family, who lived here in a pioneer community from 1816 to 1830. This National Park offers a glimpse into the young pioneer life of our 16th president. The Visitor Center features two Memorial Halls, a museum with a variety of exhibits, and an orientation film. Experience a new Lincoln handwriting exhibit where visitors can transform their message into Abraham Lincoln's handwriting and even mail a postcard out from Lincoln's Indiana Boyhood Home. Take a peaceful walk up the wooded Lincoln Boyhood Trail to the grave site of Abraham Lincoln's mother, Nancy Hanks Lincoln, and to the Cabin Site Memorial.